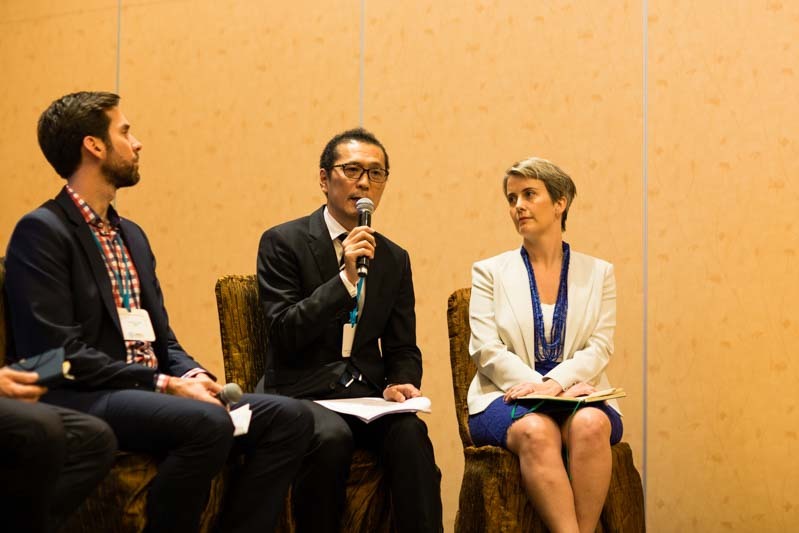 Above photo: Mr. Shinobu Yamaguchi (centre) speaking at the SDG 17 panel during the Responsible Business Forum for Sustainable Development on 24 November 2016 in Singapore. Photo by Dean Koh. Could you tell us more about your role as Deputy Director at the Ministry of Foreign Affairs? As focal point for overall coordination and policy making on matters related to the United Nations Economic and Social Council (ECOSOC) at the division, I am in charge of backstopping Japanese delegation’s negotiations and debates at the UN Headquarters in New York, Geneva and other places. What are the key initiatives within your department at the moment? After the adoption of the 2030 Agenda (SDGs) in 2015, the Government of Japan has established SDGs Promotion Headquarters at the Cabinet in May 2016 and the Global Issues Cooperation Division at which I work has served as secretariat for the Headquarters. I, together with other team members, have engaged in preparation of the government’s Implementation Guiding Principles of the SDGs, which is composed of basic policies and principles as well as specific priorities and measures to be implemented toward 2030. The Guiding Principle was finalized and decided at the Headquarters meeting held on 22nd December 2016. The preparation process includes extensive consultations not only within the government system, but also with wider stakeholders from civil society, private sectors, academia and etc. My roles at the Headquarters’ secretariat were supporting other team members in liaison with multi-stakeholders and government offices, compiling and organizing comments received and providing advisory inputs to the team. What projects are you and your department currently working on? What are the outcomes you are looking to achieve? As mentioned above, before and after the launch of the Government’s Guiding Principle, the Headquarters have been active in building strong partnership with multi-stakeholders as important partners for the implementation. For example, on the same day after the decision by the Headquarters meeting, government representatives from the secretariat joined in a joint press conference which was organized by Japan Civil Society Network on SDGs. The press conference was attended by the wide variety of stakeholders and celebrated the launch of the Guiding Principles and expressed strong commitment to the implementation. The secretariat is planning next step to get the message out and call for action in a nationwide scale. Japan will present at next National Voluntary Reviews of the High Level Political Forum in July this year. The Headquarters will proactively plan and lead communication activities to promote SDGs-related measures as a national movement in order to increase public understanding and support for engagement with the SDGs. The Headquarters, in cooperation with the UN, international organizations and other stakeholders, will also actively share Japan’s efforts with the world through a range of international conferences and other opportunities. To this end, the Government of Japan will foster the sharing of good practices among implementing partners, including the private sector, by giving awards and promoting the use of SDGs logos and branding. Could you tell us more about what is being done to encourage/foster public-private partnerships within Japan? Any specific examples with regards to the PPAP? Public Private Action for Partnership (PPAP) in the context of SDGs is critical for the achievement of the SDGs. In addition to conventional corporate social responsibility (CSR) activities, some companies have already begun engaging in activities that contribute to solutions to social issues by incorporating the SDGs into their core business. The Government of Japan welcomes this trend and will enhance cooperation with the private sector by sharing the good practices on advanced implementation measures and by giving incentives through awards and other means, with the goal of the further implementation of the 2030 Agenda. The government will also make efforts to create an environment conducive for companies in the private sector to foster innovation in their business. In particular, the private sector needs to implement sustainability-oriented initiatives such as “business and human rights,” Environmental, Social and Governance (ESG) investment, and social bonds, in order to proactively address public agendas related to environmental, social, governance issues and human rights. These initiatives are also critical for Japanese companies to maintain their competitiveness in the global market and to avoid falling behind in meeting global investor evaluation criteria, which increasingly focus on the ESG fields. The Government of Japan will implement policies to help companies meet these requirements and will support the private sector in conducting related activities. What do you think is the role of technology in encouraging PPAP? Private technologies and resources are necessary for the success of the SDGs. Science, technology and innovation (STI) is one of the priority areas of the Guiding Principles and an essential element for the attainment of targets. The Government of Japan will effectively use STI to implement a range of related measures, including enhanced international cooperation, and to solve emerging issues in a swift and flexible manner. It will also strengthen scientific analysis and evidence in setting and monitoring appropriate indicators to achieve the SDGs, analyse synergy and offset effects among the implemented measures, and take actions based on scientific analysis in the follow-up and review process. To this end, the government will foster systematic cooperation and collaboration with the scientific community as well as private research and development institutions. What are the some of the challenges faced in terms of working towards more partnerships between the public and private sectors within Japan? Any key lessons learnt or takeaways to share? As a result of its past efforts, Japan has continued to achieve an extremely high level of development. However, some areas in which Japan must continue its efforts have also been noted. For example, in the 2016 joint report by the Bertelsmann Foundation of Germany and the Sustainable Development Solutions Network (SDSN), Japan received low achievement scores regarding some of the indicators for SDG 1 (Poverty), SDG 5 (Gender Equality), SDG 7 (Energy), SDG 13 (Climate Change), SDG 14 (Marine Resources), SDG 15 (Terrestrial Resources) and SDG 17 (Means of Implementation). Japan has already begun addressing many of the aforementioned issues in its policy agenda, but there still remain areas in which Japan should further strengthen its efforts. It is indeed necessary for Japan to re-identify the issues to be tackled in relation to the SDGs and make better use of its past experiences, both domestically and internationally, to forge a sustainable future for Japan as well as for the international community. For example, the key principle of the 2030 Agenda that “no one will be left behind” is embodied in the goals of the entire international community, and reflects the concept of human security, for which Japan has been a leading advocate. This notion is in line with Japan’s domestic policies that promote a society where all citizens can participate and play an active role through its Plan for Dynamic Engagement of All Citizens decided by the Cabinet in June 2016. Under the plan, the government is implementing measures to create virtuous cycles of growth and distribution, i.e. to build a new economic system where we enhance childcare support and social security as a broader economic policy which will lead to a more robust economy. For example, many countries across the world, particularly in the fast growing Asia, are now confronted with aging populations, and Japan is striving to provide a lesson learned from its own experience for a sustainable economy and society ahead of other developed countries.